An Eagles fan shows his disapproval for announcer Cris Collinsworth as he walks down John F. Kennedy Blvd. near 15th Street prior to the Philadelphia Eagles Super Bowl LII victory parade. The special bond between the Philadelphia Eagles and their fans was on full display Thursday, with estimates as high as two million paradegoers turning out for the celebration along Broad Street and the Benjamin Franklin Parkway. The game is over. The Eagles are world champions. Nobody's dreaming. This actually happened. Still, there are plenty of Eagles fans who remain upset by what they felt was a Patriots bias in NBC announcer Cris Collinsworth's play-by-play coverage of the Super Bowl. Standing on the Ben Franklin Parkway watching a replay of the Super Bowl before the #Eagles parade and the entire crowd is arguing with Chris Collinsworth over the Ertz TD catch. I love Philadelphia. His take on a pair of touchdown catches by Cory Clement and Zach Ertz, both of which went under official review, was especially bothersome to Eagles fans watching the game. Even Eagles defensive end Chris Long called Collinsworth out after the game after he watched the television broadcast. 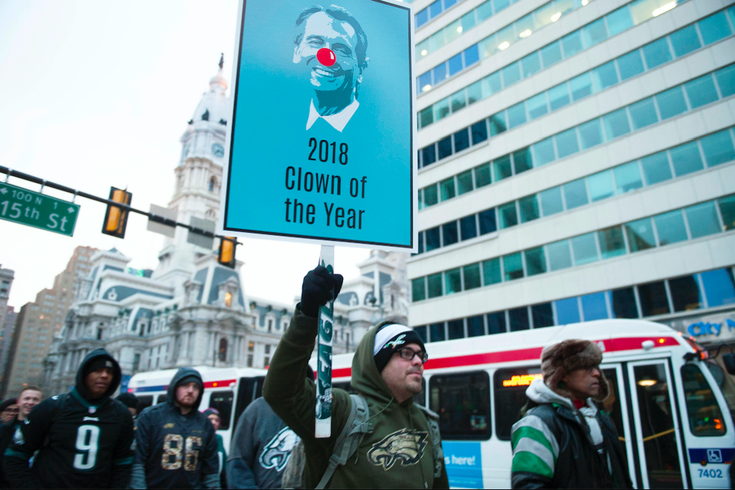 The day after the Super Bowl, fans launched a change.org petition to ban Collinsworth from calling Eagles games in the future. Cris Collinsworth is the most biased and horrible commentator ever. Being a Philadelphia Eagles fan and having to listen to him constantly talk about the Patriots and hardly ever the Eagles during the game made it almost unbearable. As a professional he has a duty to if not be unbiased at least try to make the game enjoyable for all viewers. His constant fawning over Tom Brady and the Patriots the entire game was disgusting, making it sound like he was a local Boston radio personality and not a commentator for a nationally syndicated football game. His performance brought back recent memories of the horrible job Pete Morelli and his officiating crew did against the Panthers earlier in the year. Please NBC discipline him or at the very least keep him to only commentating on Patriot games who he so very much loves. As of midday Friday, the petition had collected nearly 115,000 signatures. Is this fair? First of all, we know Eagles fans have a history of petitioning to get rid of people accused of bias. We're all aware of the petition to ban referee Pete Morelli from calling Eagles games due to an alarming imbalance in penalty calls against Philadelphia in recent years. Collinsworth didn't help his case by saying Eagles fans aren't unique ahead of the Super Bowl. Prior to the Super Bowl, Collinsworth was generally considered among the more likable and informed NFL broadcasters. He's been around for a long time and represents an era that replaced guys like John Madden and Pat Summerall when they retired. “The league’s got to figure out a way to clean this thing up. They’re destroying everything” Michaels said. “That was Cris’s frustration. When he said, ‘I give up,’ I think that was it." On some level, getting slammed by NFL fans is just part of the job description for Collinsworth. Denver fans flew into a rage against him during the 2016-17 season. It's unlikely this petition will go anywhere, but if nothing else, it will wake Collinsworth up to the fact that viewers are keying in on whether the broadcast feels fair and balanced. For a league struggling to retain viewers, it makes a difference. A look through the reasons for signing the petition should also convince him never to want to be in the crosshairs of a rabid fanbase again, least of all in Philadelphia.